Results for Product Code "733459-B21"
HP offers multiple High Output Power Supply options specifically designed for the HP c7000 BladeSystem and Superdome 2 enclosures. The c7000 enclosure can support up to six 2250W -48VDC or 2400W/2650W AC self-cooled high efficiency power supplies, while the Superdome 2 enclosure supports up to twelve 2250W -48VDC or 2400W AC self-cooled high efficiency power supplies. The power supplies for these systems creates a single power pool that can be accessed by any blade in the enclosure. This provides maximum flexibility when configuring the power in the system so that customers can choose the required level of redundancy. Because this power design has no zones, it facilitates both N+N and N+1 power modes, which future-proofs the enclosure for higher power requirements, if needed. 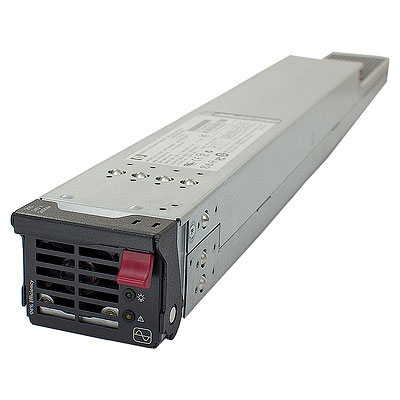 The 2400W and 2650W Platinum Power Supply options provide the server industry’s highest level of power efficiency for a bladed system - over 94% at peak efficiency and 89% efficiency with as little as a 10% load. High efficiency power supplies for bladed IT environments. Platinum (94%) and Gold (92%) certified power supply options that reduce annual data center power costs by up to $200 per power supply while helping to reclaim lost power that can be used to add more equipment to your existing infrastructure. Hot-swap power supplies that provide tool-less access for fast installation and replacement. Standardized form factor that can be used across all HP BladeSystem c7000 and HP Integrity Superdome 2 enclosures. Supports HP Dynamic Power Saver Mode providing power load shifting between installed power supplies to maximize efficiency and reliability while helping to reduce operating costs. Supports HP Dynamic Power Capping which sets power limits at the BladeSystem server and enclosure level, helping to constrain the amount of power used while reducing heat output into the data center.